This is a blog that would be good, if I had any inspiration. Five days ago I started a little social experiment on the anonymous question site Ask.fm. I was attempting to exploring the idea of anonymous questions in society and in relationships. I have now answered 154 (often quite personal) questions and I have found it to be a very interesting experience. Has it been beneficial? For me, I think it has been. But this is certainly not the case for everyone. More on that later, first lets talk about the Johari Window! The Johari Window is a communication model or a 'cognitive psychology tool' (I don't really know what that means) created in 1955 by two guys named Joe and Harry. Thus the name Johari, I kid you not! The main idea is that the Johari window is made up for four different sections or categories. Each category represents a part of ourselves. The open area is the things that we are aware of and we openly share with the people around us. The blind area is made up of the things other people know about us, but we are unaware of. The hidden area is the things that we know about yourself, but other people do not. And finally the unknown area is the things that we, and the people around us, are unaware of. The idea behind the model is that by revealing things about yourself and having other people offering their opinion of you the open area expands, causing the other (more negative) areas to contract. The theory is that by revealing things about yourself you will build trust with others, while growing in self-awareness and confidence. How does this relate to Ask.fm? The way Ask.fm allows people to ask questions and make comments about you is basically this model in action. The key difference is that the people you are sharing with are anonymous, rather than people you trust who are also sharing about themselves. The Johari Window is designed as a tool to help teams build trust and consequently work well together. But does Ask.fm still function as way to expand your open area and learn more about yourself? For me it has functioned well, though not perfectly, but I do think I am the exception to the rule. I have learn't a surprising amount about how people perceive me. For example one friend said she was surprised about how funny I was in my answers. Apparently she has perceived me as being quite a serious person, which isn't how I see myself. I almost think of myself as a jokester or at least someone who tries to be funny, so that was in my hidden area that is now in the open area. This is just one example of how I have grown to better understand how other people view me. Some people were encouraging, anonymously leaving complements and comments on my character. People also used it as a medium to criticise, or question my behaviour. Usually over my tendency to be a bit too flirtatious, my generously sized opinion of myself and my "artistic behaviours". I have looked at the things these people have said and I have thought about the way I could act/present myself to better represent the view I have of myself. This is the action of correcting undesirable things in the blind area so that they fit with the person you are trying to be in the open area. And finally people asked a lot of general questions about different things, drawing out my world view in my answers and therefore exposing more of my hidden area. One friend did, however, raise the issue that different people may perceive the answers in different ways, or misinterpret the original meaning. The lack of two way communication greatly increases the danger of this, as there is not much opportunity for clarification or explanation. So for me Ask.Fm has been a fairly healthy self-analysis of my Johari Window. But for many, if not most, users it is much less healthy. Ask.fm has become one of the worst websites for cyber-bullying. Only launched in 2010 there have already been multiple suicides and attempted suicides attributed to abuse on the website. The problem again is in the anonymity of the people asking questions. One or two people can post a hundred messages of hate, and the receiver will assume a hundred people hate them. There is also no way of telling whether or not you actually value the opinion of the sender. Most people tend to assume the people asking questions and sending abusive messages are from the people they value and love. When in reality it is most likely the exact opposite. Ask.fm really is a double edged sword. It is only in the anonymous nature of the website that people feel open to ask many personal questions and make comments about people. But allowing the asker to remain anonymous gives them too much power and creates the perfect platform for cyber-bullying. So to answer some of my original questions, yes it is good to ask personal questions. But it is not good to do so anonymously. Just be bold and ask them personally. 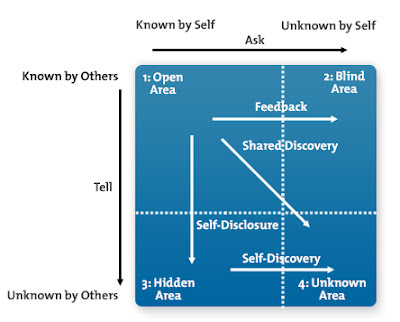 Allowing people to ask you questions anonymously does offer the opportunity to develop yourself as a person and develop your confidence by way of the Johari Window. But it also sets you up as an extremely easy target for cyber-bullying. So all considered, despite my very positive experience, I think Ask.fm is a website to be avoided. And anonymous communication is not something that should be encouraged as part of our social lives. Instead, sit down and work on your Johari Window with a group of close friends or colleagues. For a long time I have be interested in how people think, behave and interact with one another. So when this new anonymous question asking website showed up, and introduced a new way to for people to relate to each other, it naturally caught my interest. Initially I basically wrote it off as a high school gossip machine, like one of those horrible 'confession pages' on Facebook. But the more people signed up for it the more I became curious about it. However, I didn't think to seriously about it as a part of society until I asked someone (on Ask.fm) if they thought it could be a relevant part of society, like Facebook. The reply surprised me: "Yeah, it could. Provided it was used in the right way". So that got me thinking about the role of anonymous questions as a part of our society, a part of relationships, a part of communication. I decided the best way to determine the quality or function of anonymous questions, would be to create an Ask.fm account and try it out for my self. It hasn't even been 24 hours yet, but I have answered over 80 questions and I am finding it to be a very interesting experience. I would write about how I feel about the website, but frankly I am not sure yet. Are anonymous questions beneficial to a relationship or not? Does the ability to ask anonymous questions bring us closer to our friends and enable us to understand them better? Or does it just make our friendships less and less personal? Does allowing people to easily contact you anonymously simply turn you a target for cyber bullying? Or does having the chance to make statements about yourself build your confidence? Is it a positive way to relate to people, or is it not really communication at all? Is it good to ask such open and personal questions, anonymous or not? I'll let you know when I come to any conclusions! Thanks for reading, look out for another post soon. 5 Youtube covers/live versions I can't get enough of. There is around about 120 million videos on Youtube (according to Yahoo Answers). Most of that is generic rubbish, but there are is small number of musical moments that keep drawing me back for another listen. In a world where we expect new and more exciting things everyday, it its only a brilliant video that will keep bringing someone back again and again. Remember this song from T-Pain? This is Jesse McCartney's 2008 jazzy/white R&B arrangement of it. It is real fun and exciting, with a "nasty groove" as McCartney says. The jazz style instrumentation with the R&B backing vocals is an force to be reckoned with. If Jesse McCartney made a whole album like this, I would buy it. Classy R&B, I haven't heard anything like it. That is why I keep coming back. Folk music is always better live. Ben Howard is a brilliant song writer and a great vocalist. But what I love about this video is not really Ben Howard, check out the band! I'm not sure that I have ever seen a group of musicians care for a song so beautifully. They dance through their parts like they are carrying a newborn baby. Every sound they make is carefully considered and used to add to the music. They are all taking it very seriously. The dynamics are stunning and the arrangement is surprising and dramatic. The bands chemistry is awesome and India Bourne (bass guitar) is awesome. I had been listening to this cover for awhile then I checked out the album version. I was very disappointed. Didn't have anything like the tender love and care that this version does. I love it. Written by Mark Reid and Allen Shamblin, "I Can't Make You Love Me" was made popular in 1991 by Bonnie Raitt. Mojo magazine put it at #8 on the 100 Greatest songs ever. It made it onto the Rolling Stones The 500 Greatest songs ever. Then Bon Iver came along and made it better. Future of Forestry is a great band and this video is great display of their musical prowess. They are so tight and well rehearsed. The use of multiple alternate instruments gives a diverse and huge sound. All from a 3 piece band! It is also beautifully filmed with awesome lighting! Not many videos like it around. Amazing work. Maybe I am just a huge the Edge fan, but when I stumbled across this video I was amazed! Such a beautiful performance, great guitar playing, great vocals. And it is refreshing to have The Edge in the limelight. Singing to an empty room concert hall just adds to the drama. While he was recording the original version for Achtung Baby the Edge split up with his wife. That breakup radically affected the Edge and the Edges influence on the song and he became very attached to it. Allegedly breaking several strings while recording the guitar solo. Not that anyone really reads this, but if you do: please share your favourite videos in the comments below! Lately I have been pondering what music is and how to make it and I have come to a conclusion about dimensions of music and what 'musicians' really have to do to create music. So I have created a short list of roles a musician must play to create pure music. It is very important for musicians to explore the world of music, I use the word 'explore' because of the creative implication. Exploring suggests getting out there and finding out for yourself, not waiting for someone to tell you. The bible often tells us to be like children, I try to retain that innocent approach when it comes to music. Just trying things, ignoring whether or not they are 'correct'. Experimenting with different tones, instruments, tempos, keys anything! This is important to be original and interesting in the world of music. Exploration = understanding and creation. A band that is crazily into exploration of music is Mars Volta, I'm not saying I like them very much. But when comes to merging styles and creating strange things, these guys are pretty good at it. I will warn you, this is quite hard to listen too if you are not into weird progressive rock. So you might want to skip this video and go straight to the next one. Wow. Okay that was awful, you are right. When I was interviewed for entrance into my music school, I was discussing with the interviewer about my lack of music theory knowledge, and she said "you have a good understanding of your instrument but you don't understand the nuts and bolts of music". I instantly knew she was wrong, I do. The essence of music, the nuts and bolts that holds everything together, is emotion. There have been countless debates about what music is, some people say all sound is music, some say only harmonious notes set in timed sequence, but in reality there is no such thing as "music". What we call music is merely the physical representation of emotions and concepts, represented by sounds and words. The composers (and musicians) job is to translate these raw emotions into sound. This combination is called music. Far too often people miss this step and focus solely on the accuracy of sounds, the perfection of sound. I think this is an aimless pursuit without first discovering an emotion and a concept to give meaning to you sounds. This is just an amazing example of someone connecting to an emotional idea and representing it in sound. Notice that the piano is old and out of tune, his voice isn't perfectly accurate and he uses awful piano playing technique. But the amount of emotion he shows use through sound is incredible. This is the second key element of making music. Whenever I attend a concert I always take a moment during the performance to look around the collection of people listening. The audience is as much part of the music as the band themselves. When I look around the room at a concert I don't see a room full of strangers, but a roomful of people connected to me, feeling the things I am feeling, thinking the things I am thinking, seeing the things I am seeing. A room full of people connected to one another. Connected by sound, by emotion and by mutual love. Connected by music. As musicians we have to arrange our music in such a way that it connects with people and connects people to others. This is something Mars Volta misses, the craziness of their music mostly isolates people. People don't like it, and that detracts from its quality as music. Adeles performance at the Brit awards is a perfect example of a song that creates connections. Someone Like You is a song full of emotion that everyone can connect to. Everyone in that audiance would have some memory of being rejected or abandoned. And they are all thinking about that time. They all feel melancholy and they understand each other. Adele lends a voice to their pain and they all feel better knowing that there is hope, everyones gets rejected and that's heartbreaking, but okay. Notice Adele herself is practically crying at the end of her performance, she wasn't thinking about the singing, she was thinking about rejection. And because she was, everyone was. Sung to an empty room this song would be lacking in one of the key musical dimensions. CreativeSound+Emotion+Connection=Music. We could stop here. But as I Christian I would like to take it one step further. The connection should be more than just between you and the listener, it should also connect with God. It was God who gave us the gift of creativity. Nothing else in the known universe creates art. An orangutan will never arrange a group of flowers on the the ground just because they look beautiful, some animals build themselves shelters but that is intelligence not creativity. God created us and, the bible says, "breathed his spirit into us". It is the spirit of God that gives us creativity. So when we create art, like music, we should be offering some amount of credit to God. And as we appreciate music, we should be offered an opportunity to appreciated God through music. When I was at U2's 360 show in Auckland last year I remember thanking God for everything he had done, for all the great things he had created and I asked him to be close to me. U2 didn't publicly say anything about God, or verbal encourage us to worship. But in the way Bono acted and in his lyrics and lifestyle he reminded us of God spirit inside us and inspired me to worship. This is the final and most important element of music. Worship. I would love to hear your opinion or your additions to the list! What else should a musician do? What other 'dimensions' of music are there? *The Free Online Dictionary defines music as: "The art of arranging sounds in time so as to produce a continuous, unified, and evocative composition, as through melody, harmony, rhythm, and timbre." I believe there is more to music than this, but when I say "Explorer of Music" this is the definition of music I am referring too. Guitars are old fashioned. Bring out the piano! I am a guitarist, and one would expect my influences to be the guitar hero greats; Slash, Jimmy Page and whatever the guy from Queen is called. But they are not. These guitarists (even ones I admire like John Mayer) always come across as overbearing, arrogant, and generally distasteful. But do not fear! I have found the salt and light of the musical world. Piano players! I was asked by my guitar tutor a few weeks ago who was a guitarist I idolised, instantly three pianists names came to mind before I finally came up with The Edge, there is something about that instrument. So I am going to pull up some random youtube videos of pianists and have a little ramble about why I like them. Andrew McMahon - Jacks Mannequin "Amy I"
Listen to that intro! Stunningly simple, surprisingly groovy and twice as interesting as a guitar playing the same type of thing. Then the vocal comes in! Piano was actually built as a vocal accompanying instrument (people who play them in orchestras and concertos are being down right disrespectful), it sounds incredible with human voices and offers so much more percussive impact than a guitar ever could. There that is what I wanted to say! Piano offers a percussive and melodic beauty to music. Notice in the chorus that it provides powerful attack for the guitar part. Sure you are listening to the guitar, but drop that piano and you have a dead boring song. I'll be honest, I am kind of just including this guy because he is really cool. But this also shows us more of the piano, this same song on the guitar would be sad and boring. But on piano it is an energetic, exciting song. The piano is the whole band in this video, bass, chords, lead, rythym everything! He also plays a great little solo bit and the dyanamic variation in a piano is a powerful force of beauty. This not only displays once again the power of the almighty piano, but also the spin off instrument the synthesizer! I don't have a lot to say except: could you make something this exciting with just a few guitars? I don't really care about Adele or this song (actually I love them both), the reason I include this video is because it is a great example of songwriting talent. This was written (largely anyway) by Ryan Tedder and it won a couple of Grammys. There are others songwriters too, Paul McCartney wrote most of his songs on the piano, Chris Martin mostly writes on piano, Bono writes on piano, Elton John, Norah Jones, the list goes on and on! My point being this: Pianists are better songwriters. And I've no idea why. That is my aimless blurb about the piano. Guitars are old fashioned! Bring on the keyboard!!! 5 Reasons you should have your photo taken. I am an amateur photographer. I not especially good at it, but I have an old well loved DSLR (Canon Rebel if anyone is interested) and I love to show up at events and take photos. Its like capturing an event for all time. But I have an problem and I am sure many other amateur photographers also have this issue. People who won't let you take photos of them. Those people who turn their heads away, hide in a bedroom or cover their face with their hands. This worst culprits are teenage girls, but I also know many guys who also refuse to be photographed. So today I will point out a few things about this issue. You will probably know that x-rays are not very good for your health. They use radiation and if you receive too many x-rays you are likely to get cancer. Cameras are not like x-rays, they do not give you cancer, brain damage or any other diseases. There are scientists all around the world who say that every time you call someone on a mobile phone, you increase your chances of brain tumours. I have never heard anyone say that camera's give you an illness. If you're not in a photo, you weren't there. Often I take photos at camps, and afterwards I make a selection of the photos that best represent the event and upload them. Nearly always people send me messages requesting more photos so they can have "more great memories of this camp". Most people remember by looking at photos and as you get older your memory deteriorates. Have you ever sat down with your parents or grandparents and looked through their old family photos? Laughed at the fashion, listened to their stories surrounding the photo? Don't you want to be able to do this with your future kids and grand kids? If you are not in any photos you will not have these opportunities. And worse: No one will remember you. The more photos taken of you, the better. Have you noticed that the cool kids always end up in lots of photos? You should be flattered if someone wants to take lots of photos you. I don't know if this is just me, but I am always offended when someone refuses to let me take a photo of them. To me it says: 1. I don't trust you with a photo of me. 2. I don't want people to know I was hanging out with you. And 3. You are awful photographer, people always look awful in your photos. If any of those things are the case, then just tell me that. So that is the end of my speel about those people who won't have their photo taken. So remember these holidays: Nothing bad happens. People remember you by looking at photos of you. If some one takes lots of photos of you there is a better chance of a good photo. If people like taking photos of you it means you are popular. It is offensive to always refuse photographs. P.S I am sorry if I gave anyone the impression that I know anything about photography or people. I do not know if these ideas reflect the ideas of other amateur photographers, it just a bunch of stuff the popped into my head. If you wish to debate against something I have said please do! Post a comment below, I would love to hear you opinion. Life is an interesting thing. I haven't worked out why yet, but thats what people keep telling me. I am writing this in the corner of my parents garage. I am sitting on an old couch that was rejected by the family as acceptable living room furniture. The wall to my left is covered in crude shelves and they are filled with the cluttered treasures people hoard and disregard. Memories and potential. Some active, some passed. To my right is another piece of rejected furniture, a large table. Reliced by years of being used by a big family. It is covered in whatever music gear my brother and I could scavenge. Microphones, tamberines, shakers, an old stolen P.C screen, a stereo that belongs in our parents lounge and a collection of tea cups. My brother is sitting at this table writing a song about appreciation of life, a song about hope. My sisters are also occuping this room but they are remaining quiet as so not to put off any flows of creativity Tim may be having. And I have chosen this time to reignite this old blog. Sometimes I feel the need to create, to write, to share. I don't know that I handle emotions very well. I often don't understand how I feel until I write something and then I suddenly understand. Sometimes I discover myself through song, sometimes through a piece of writing, like this one. I still don't know why I am writing this. I guess I want to send something out into that cosmic void we call the internet. Blasting some random collection of words off into the internet, like an unguided ship into space. I don't what will happen, except I know nothing will happen. And for some reason that is exciting. I like the idea of someone reading this and then, in some bizzare and semi-fictional way, us being connected by the piece of my soul, of me, that I have recklessly dumped into these paragraphs. I write without a filter, my subconscious mind thinks it, and then my hands type it. It is like I am telling myself a story and I am writing it down, so I do not forget. I wouldn't call this inspiration, that is different, this is mearly venting, letting all my thoughts out so I can sleep tonight. Thoughts about music, life, fun, bordem, fear, peace, love, there is so much to write about! So many things going on! Not one of them worthy of a film or a book, but not one of them worthy of forgetting or disregarding! So I will aspire to write it all! All the elements of this apparently-interesting life we call our own, all written on a page on my bedroom floor or cast into this cosmic void. All beautiful, all boring, all life. P.S At this stage I would normal go though my writing and see if there is anything worth publishing. Given the occasion of tonight I will not. I will not even read it through again tonight. I cannot really remember what I said. I'm not even doing spell check. This is as raw as it comes. Look out for some more refined posts further down the line.